Play Faerie Nights Slot Online with 500 Free Spins! Faerie Nights is a 5 reels, 25 paylines online slot game by 1x2 Gaming. Faerie Nights has Scatter symbols, Free Spins, and Free Spins Multiplier features and an RTP of 96.00%. The Faerie Nights slot is just one of over 500 leading UK online slots we offer at Rose Slots including Fluffy Favourites, Starburst, Rainbow Riches and Great Rhino. The world of magic and enchantment appeals to all of us, young and old. That’s why J.K. Rowling’s ‘Harry Potter’ series of books and films found such a wide audience, even though it was ostensibly only designed for children. All of us would love to believe there are witches, wizards and other magical creatures out there with the power to grant us wishes, and bring fortune to our lives. If you do believe that, we’re not here to shatter your illusions. Instead, we can tell you that the spirit of magic and wonder is very much alive in Faerie Nights by 1x2 Gaming. This is a slot that brings enchantment like very few other online slot games we’ve ever played and tested. It’s a beautifully designed and fully realized enchanted forest, where every effort has been made to build an immersive world. The reels are woven from wood and twine, with the transparent symbols allowing us a glimpse of the land behind them, with canopies of trees stretching away into the distance. It appears that the landscape is on the cusp of night. In an original twist as far as online slots go, the timeframe can actually change when you’re playing Faerie Nights. If you enter one of the bonus features, it will become night-time properly, and all sorts of mystical creatures will come out to play. If you know a little about technology, you’ll probably be aware of ‘Silicon Valley’ in America, which has been heralded as the area of the world responsible for most internet and technological development. But did you know that Great Britain has its own Silicon Beach, which serves as the unofficial home of the UK online slots scene? It’s in Brighton, which is where you’ll find the head offices of 1x2 Gaming. 1x2 Gaming, which has been open for business since 2002, is active in all areas of the online casino industry rather than just concerning themselves with online slots, but when they do produce slots, they tend to be impressive. Faerie Nights was released in early 2019 and is one of the most high-profile of the developer’s most recent products, but they’ve also had great reviews for Pots of Luck, Neon Fruit and I Am The Law. Even people who have no interest in online slots whatsoever may know them for their Virtual Football platform, which the developer bill as being the most complete virtual sports software anywhere on the internet. There are five reels and three rows to play with, in a layout that's common of many online slots. What's less common is the sheer beauty of what appears on them. Even the least valuable symbols - in this case, represented by J through to A - have been given elaborate decorations to ensure they fit thematically with the mood of the slot. Above them are creatures drawn from legend and fairytale - pixies, elves, and butterflies, accompanied by strange wild flowers and mushrooms. Most valuable of all the symbols in the base game is the most exotic of all mythical beasts, the unicorn. Finding five unicorns on one paying line will award you a payout of 50x your initial bet. There are several additional symbols which may appear in this slot - some during the base game, and others which reserve their appearances strictly for the bonus features, which we'll address when we come to look at them in more detail. During standard play you may encounter a being known as the ‘Tree Ent' - a man who's half human and half tree - and he's the slot's wild. Whenever he appears, he'll expand to fill his entire reel. He can replace any of the standard symbols, but won't replace the beautiful faerie queen, who serves as a bonus and scatter symbol, and can use her powers to transport you to the bonuses. Let's head there now and find out what else Faerie Nights has to offer. There’s a unique twist on the bonus feature in Faerie Nights - and we stress ‘feature’ because there’s technically only one - and that’s the fact that it changes the setting of the slot from daytime to nighttime. That’s another chance for Faerie Nights to show that it’s head and shoulders above most other online slot games with its gorgeous animation and character creations. To enter nighttime, you need three or more of the Faerie Queen bonus symbols to appear on the reels as part of the same spin. Three of her will bring you seven Free Spins. Find four of her, and she'll bless you with nine spins, and a full fleet of five fairies will get you eleven free spins. During free spins, a different Faerie Queen might appear - the dark-haired nighttime counterpart to her blonde daytime sibling. She serves as a wild and also multiplies the value of any paying line by x2. There's another new symbol at night time in this slot - a will-o-wisp. It's a sticky wild, so once you've found one during your free spins, it will stay there for however many you have left. You could easily end up with multiple sticky wilds on your reels by the time the feature ends, which should make this a profitable experience for you. On your final free spin, multiple additional will-o-wisps will appear to give you a final guaranteed payout before sending you back to the daytime forest. 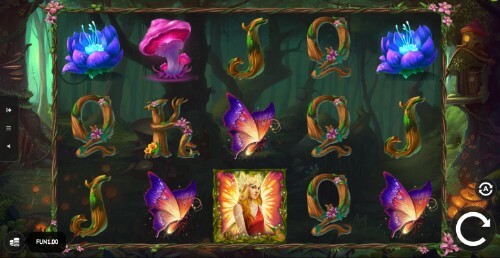 It's not often you find yourself using the word ‘adorable' to describe online slots, but in the case of Faerie Nights, we can't think of anything more appropriate. It's not especially complex or layered, but it's exceptionally well-presented and entertaining.